University of Limerick has unveiled the new UL Glucksman Library, which has doubled in size and capacity, thanks to its remarkable auto-retrieval system. The new Glucksman Library now includes a range of world-class innovations in book storage and retrieval, digital research, accessibility and inspirational learning spaces. One stand-out feature is the ARC (Automated Reserve Collection) - a 10 metre high book vault and robotic crane, with the capacity to store 500,000 volumes in a space 1/9th of conventional shelving, which will see UL’s historic collections, currently housed off-site, returned to campus. 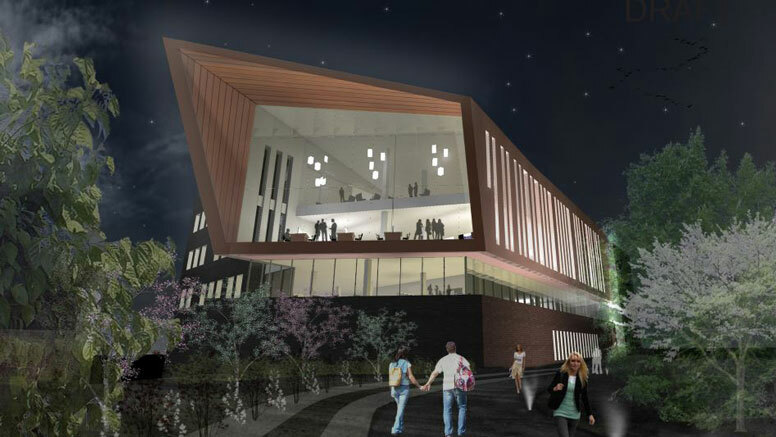 The library, on of the busiest places on campus, will now provide 2,200 study spaces and a range of specialist zones to meet the changing needs of UL students and researchers. The new building is named for the Glucksman family, long-time supporters of the university and in particular the UL library development. Speaking at the event Loretta Brennan Glucksman praised the building’s progressive design and its focus on the future needs of students. University of Limerick press release. Report, photos, video from the RTE news website. Report, photos, video from the Limerick Leader.